Another week of winter chinook fishing and not much has changed. The big highlight of the week was the great weather on Monday. With the holiday many customers were out on the water enjoying the relatively calm seas, blue skies, and that big yellow thing in the sky called the sun! The same theme from the past 2 weeks continues, you need to be at the right place at the right time. 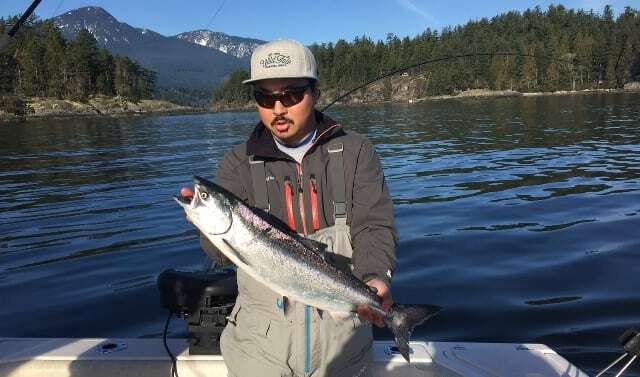 There continues to be some fish taken up Howe Sound, the harbour was slow for the most part, Coal Ports was slow for the most part, and Porlier was over run with sea lions and fishing was tough. Most of the fish that were taken were of typical size, in the 8-12 pound range, but we did see one fish that was 20 pounds. The usual technique of keeping your gear close to the bottom and using glow flashers and glow spoons has produced the majority of the fish. Take a look at previous blog posts for lots of details. Some anglers have been catching fish on bait as well. We saw a picture of a fish that had around 20 herring in its stomach. So herring will obviously work as bait, but it should be noted the herring in this chinook were very small. An anchovy would be a better choice to match the size of bait these fish are feeding on, or if you can find it, very small herring, called “Red” in terms of the size that they are. These are usually pretty hard to find at the stores, so most anglers choose anchovies. We prefer to fish spoons with some scent because you can troll fast and cover water. Use a small spoon, like a Pesca 2.5, a Kingfisher 3.0, or a Koho Killer. Any colour with some green and glow in it will produce. Popular colours are Gut Bomb, Irish Cream, Homeland Security, and Yellow Tail. 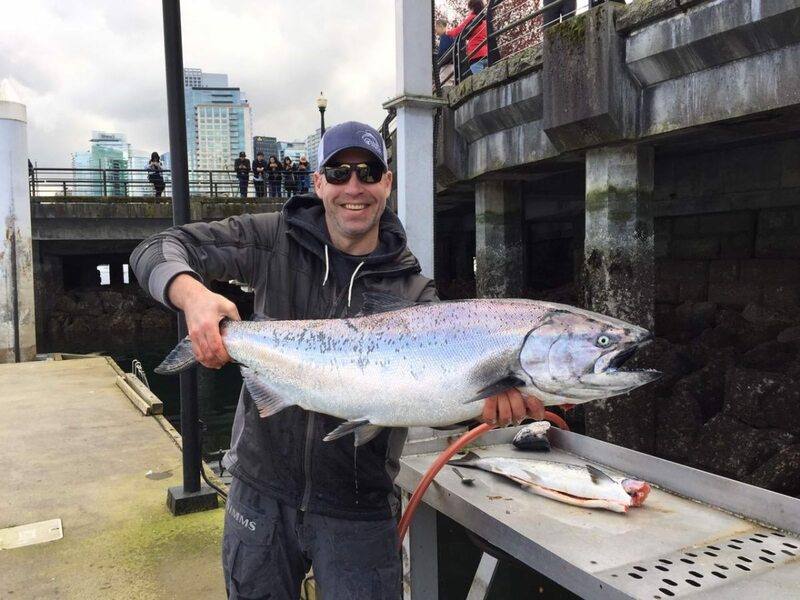 There is plenty of season left, so pick your days when it is calm and sunny and get out and catch some of the best eating salmon of the year.